Robin....... "Holy Crap Batman! You are worth a bundle $$$$" !!!! Batman....... " Of course I am Robin,you puny little sidekick!" 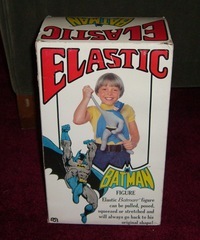 This Mego Elastic Batman is now the most valuable stretch on the planet and possibly the single most wanted stretch ever in stretch History next to the Denys Fisher and Mego Hulks.This is no lie.... I recently won this mint Batman on an ebay auction. There were 42 bids! and I remained the high bidder throughout the entire auction bidding $500 more every time someone came within 200 dollars of my highest bid. Bids reached $3,150 up to the last 4 seconds, when all of a sudden it shot up to $15,100 bucks! Holy Crap!, $15,100!!!!!! 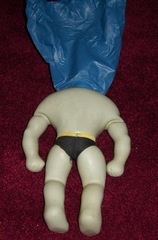 Me and another bidder wanted this Batman something terrible. Can you imagine the look on the face of the 15,000 dollar bidder when he saw 15,100!! I could just feel the grey hairs popping out of my cranium on this one. A truely amazing auction with suspense up the ying yang! This auction will go down in the history books as the biggest stretch auction ever!.This is almost no doubt the last survivor in this outstanding totally mint condition. I have another Batman that although not totally mint is very very nice and clean and I may sell it soon for a very fare price.These are the only 2 known examples I have actually seen in all my years of collecting. The Batman is that rare!These Batman Stretches a Batman collectors dream! 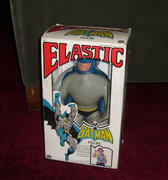 Now 3 years later the Mint Mego Elastic Batman is valued at well over $20,000 and may even bring in up to $40,000.What an amazing piece to have thanks to the guys at SquareTraders Inc. Specializing in Estate buyouts. From Elastic Batmans to antique wood desks, you never know what these guys might have. These guys are the most honest and nicest people you want to meet and do business with.Tom, Chris and John ,the owners of Square Traders Inc. were very flexible to say the least at working out the purchase of this fine Specimen. If you ever see there Ebay Auctions, do not hesitate to buy from them. You will be very satisfied. Who knows, maybe youll find another Batman! Thanks again to the cool guys at Square Traders Inc. for giving this Batman the right home. Their email is Mrlisters@comcast.net . They also have a website. Batman is in fact the most valuable Stretch in existence! worth well over $20,000 ! 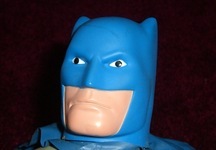 A most perfect Batman Head. This truely is an amazing piece to have in such perfect condition. The Cape is still attatched to the neck with no rips. this is immpossible to find because the capes were always ripped off when played with. 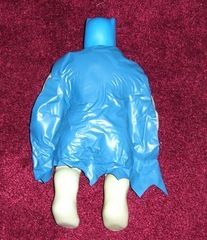 This is one of only 2 known Batmans to exist to date. 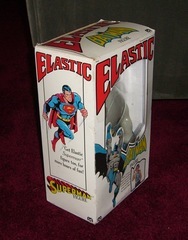 I have just made a trade for an equally rare Ensueno Superman for one of my 2 Batman Elastics. 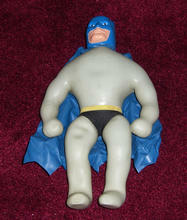 Mego Elastic Batman is truley the most valuable stretch ever!